Lighting art, like so many aspects relating to the collection and display of artworks, can be a very subjective experience depending on a large range of factors, not least of all the nature of the artwork itself. However, on top of factors relating to the literal appearance of the artwork there are other factors relating to the preservation of the artwork. Works on paper are particularly sensitive to all forms of lighting and should be regularly stored away. All works, in fact should be displayed on a ‘rotation’ system with works spending occasional periods in a dark storage area. The traditional incandescent light bulb which generally emits poor light that is red/yellow in colour, thus enhancing the warm-red colours in displayed works and eliminating the cold blue/greens: all light will enhance the reception of colours in its own field and dampen the effect of opposite colours. Fluorescent lights will eliminate a wide range of colours, especially blues and greens. This is used very rarely for conservation purposes, but can be very damaging to an artwork due the large number of U.V. rays emitted. Natural daylight can be ideal visually for viewing an artwork. However, daylight can vary greatly and cannot be a sole source of lighting. Additionally, due to the high content of radioactive UV beams in sunlight, this can be very damaging for both paper works and paintings. Galleries rarely ever rely purely on daylight, especially where valuable works are concerned. 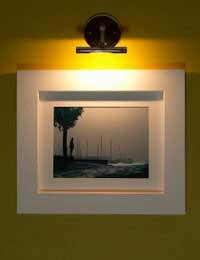 Halogen lighting is generally felt to be the best for lighting artworks, due to itsneutral colour and its lack of UV rays. It can also be easily installed in the ceiling preventing the direct face-on lighting of works: face-on lighting, at an angle of 90 degrees from the work can be very damaging over time. Taking these factors into account, you may feel that you wish to use a halogen bulb, ideally placed so as not to be directly lighting your work. However, the presence of daylight may also be a factor. From a purely visual point of view you will want to be careful to account for the factor that daylight may play through changing seasons. You will also want to be careful to neither under light or over light your work. This additionally involves insuring that your work is not be lit unevenly. The best way to address these issues is by eye. A second opinion may be handy to account for deficiencies in your own eyesight (a third perhaps if both you and the second person involved have poor vision!). Beyond this a considered look at the quality of lighting in a major collection should suffice in giving you ideas for the lighting of your own artworks. When looking at major collections it is worth noting the care taken to enhance the lighting inherent in an artwork. Old master paintings, for example, will often employ extremes of light and dark and it is important in this case to bring out both the highlights and the lowlights. Striking this balance can be tricky, but generally this is achieved by going for a fairly neutral lighting. Anything too bright will make the highlights too striking, whilst reducing the impact of the lowly lit areas.